King's Ely is a co-educational Day and Boarding school for children aged 1 to 18. King's Ely has a total of 465 pupils, with 164 pupils in the Sixth Form. Day pupil fees are from £6951, per term. Boarding pupil fees are from £10063, per term. Nestled in the heart of the beautiful cathedral city of Ely, King’s Ely is an inspiringly visionary independent co-educational day and boarding school, yet one that is built on a fascinating history stretching back over 1000 years. We serve the academic and pastoral needs of around 1,000 boys and girls from the age of one right the way through to 18, with boarders from seven years old. King’s Ely is located just 15 minutes north of Cambridge and a short walk from Ely train station, with school buses stopping at key locations around the area. The adventure of a King’s Ely education enables pupils of all ages to flourish, from the babies and toddlers in King’s Ely Acremont and Nursery to the young men and women in our Sixth Form; and whether a student shines in a classroom or lab, on a stage, on a pitch or on a mountainside, our school promises an abundance of opportunity for personal development, both academically and socially. We empower our young people to challenge themselves, to push beyond the boundaries of their own expectations and to achieve more than they ever believed possible. King’s Ely students achieve excellent GCSE and A Level results, with 98% gaining places in their first or insurance choice university. But our school is about much more than league tables. Innovative approaches to teaching and learning are the hallmark of every section of King’s Ely. Through a broad and balanced curriculum, pupils develop the self-knowledge and inner resilience that will enable them to face the challenges of an ever-changing world. The aim is to create responsible and engaged young people who have developed learning habits that successfully prepare them for public examinations, higher education and the challenging world of work. At King’s Ely Acremont and Nursery (ages 1-7), such development demands a planned, creative curriculum that is dedicated to the needs of younger children, encouraging them to be independent learners with a passion for knowledge. It requires caring experts who have the time to give younger pupils lots of individual attention and a beautiful, spacious environment that allows children to explore in order to discover the exciting world around them. Moving on to King’s Ely Junior (ages 7-13), it demands a positive and enriching atmosphere, a commitment to unlocking potential and the development of conscientious, compassionate young people. At King’s Ely Senior (ages 13-18), it demands exceptional teaching and a culture of independent learning, enabling students to take ownership of their own educational journeys, where results are achieved through inspiration and support, not unnecessary pressure. Our students are encouraged to develop their creativity and critical thinking. Pupils identify the key questions they want to ask and then find answers supported through their own learning. Issues are explored rigorously from multiple perspectives and assumptions, including their own, and then critically analysed by the class. Consequently, conclusions reached are supported with reasoned arguments and evidence. King’s Ely boasts some of the region’s most historic, picturesque buildings yet teaching facilities are modern and purpose-built. Our close links with Ely Cathedral – one of the finest cathedrals in the world – make the perfect setting for concerts and performances, a daily extension to the school’s workspace, the school chapel, and a place of outstanding beauty and spirituality. Music, drama, art and textiles are each embedded in the culture of King’s Ely, with vast opportunities for pupils of all abilities and aspirations. Last year, an A level student was offered places at both the Guildhall School of Music and Royal College of Music – a prime example of the expert and specialist teaching available at King’s Ely. All major sports are offered, along with an impressive array of other activities, helping every pupil to realise their sporting potential. Rowing, athletics, golf, cricket, hockey, tennis, rugby, netball, equestrian and football - the choices are endless. The working week, which no longer includes formal lessons on Saturdays, also enables pupils to participate fully in regional and national events. Our reputation in rowing advances year on year, with our use of one of the best stretches of river in the country. 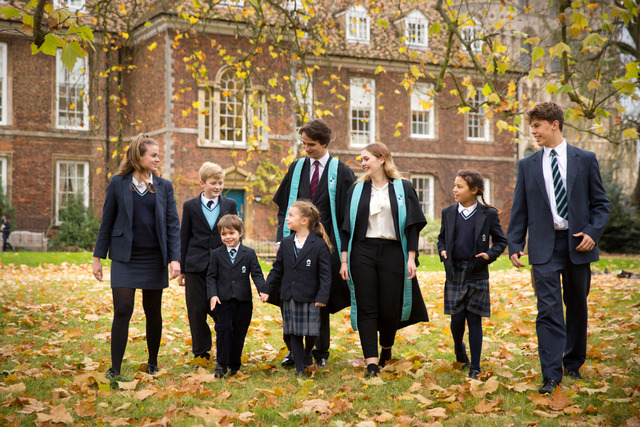 King’s Ely is a family – a community that is vibrant, nurturing and inclusive. We are a school that can take each child on a seamless journey, travelling from one section to the next, whilst welcoming newcomers at key transition stages, giving support and adapting the offering to the needs of every child in our care. Only by visiting King’s Ely can you feel the energy and warmth of our community. To discover more about King's Ely and/or to book your personal visit, please visit www.kingsely.org or call Admissions on (01353) 660707. Please call our Admissions Team on (01353) 660707. Welcome Video from King's Ely on Vimeo. Sorry. No Open Day dates have been provided by the school.